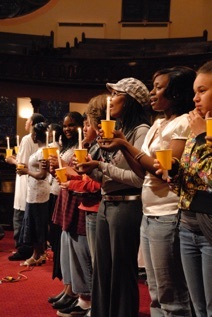 Twin Cities Public Television created this program from footage of the “Go Light The World” event which took place at Westminster Presbyterian Church in Minneapolis in May of 2007. The event honored and sent forth young Minnesotans preparing to represent our great state at the Brave New Voices International Youth Poetry Slam Festival in New York City. 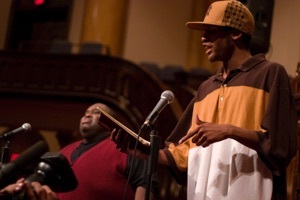 TWIN CITIES PUBLIC TELEVISION in collaboration with the Minnesota Spoken Word Association (MnSWA) has created this powerful regional Emmy Award-winning one-hour program entitled Urban Youth Poets: Quest for the Voice. The program features talented young people from urban Twin Cities schools sharing their stories, dreams, experiences and perspectives through the power of spoken word. The themes the youth poets explore are brave, identifiably honest, and sometimes heartbreaking. They move through insightful interviews and powerful performance poetry exploring themes that include poverty, peace, prejudice, immigration/citizenship, family violence, youth empowerment, substance abuse, teen suicide, GLBT issues, gangs, homelessness, education, and fulfillment of Martin Luther King Jr.'s dream. 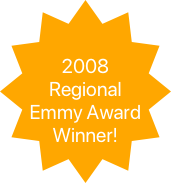 The program premiered on Twin Cities Public Television in January of 2008 and the response from viewers was extremely positive. The program has served as an excellent educational tool to inspire dialogue among and between young people and adults around the important social issues presented in the poets' work. If you missed it, a DVD of the program is now available for purchase for $15 for individuals or $30 for organizational use (+$5 for shipping). This production was made possible in part through the generous support of the First Universalist Foundation. 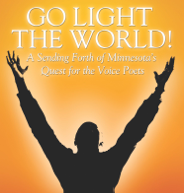 100% of the profits from the sale of this DVD will be used to support youth poets participating in the Quest for the Voice program. Poets Rodney Dixon with Robert Robinson, Caitlin Hill and Berato Wilson. 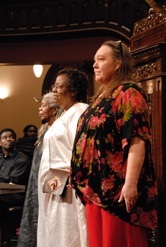 Community elders, Naima Richmond, Amoké Kubat and Julia Dinsmore. Contact Brian Mogren at (612) 965-9446 or brian.mogren@mac.com.